Peter Coad - Old Bush Mates (Released April 2011) (CD)The album picked up 3 TSA awards in January 2012 and was awarded "Album Of The Year" at the Bungendore Stan Coster Bush Ballad Awards in February 2012. Coad Sisters - The Journey - March 2019 (CD). PETER COAD & the COAD SISTERS – ‘Home Again’ (Released August 2003.) with four finalists’ tracks featuring in 2004 T.I.A.R.A, TSA and Bungendore Stan Coster Memorial Bush Ballad awards.February 2004 saw COAD SISTERS unique version of the classic bush ballad "Ballad of Camooweal" from the "Home Again" album take home the prestigious Instrumental/Vocal/Group/Duo Award at the Bungendore Awards. 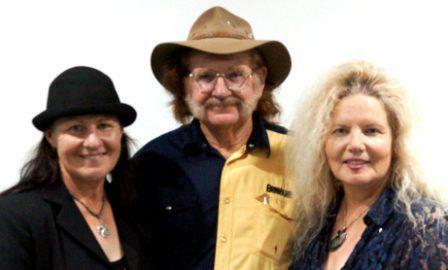 PETER COAD & the COAD SISTERS - 'The Road We Travel'. (Released April 2005) which scored Finalist spots in the New Zealand/Tasmanian Songwriters Awards 2006, Bungendore Awards 2006 and the Bush Ballad section of the Victorian Awards 2006. Winner of Bungendore Awards 2012 – ‘Album Of The Year’ @ Gidgee Coal Bush Ballad Award. PETER COAD & THE COAD SISTERS - '25 Years Revisited' - Released 29th of July 2013. Containing a selection of tracks from album and singles, mostly not available any more. > List does not include COAD BROS recording from the 70's & 80's nor CDs the Coad Sisters have also recorded under other band names.